The Gemara in Shabbos (21b) records that one should preferably light Chanuka candles at the doorway of one’s home. Rashi (s.v. Mibachutz) writes that one lights in a chatzer (shared courtyard) but not in the reshus harabim, whereas, Tosfos (s.v. Mitzvah) writes that one lights at the entrance of one’s house only if it is adjacent to the reshus harabim, but if the house is inside a chatzer, one must light at the entrance of the chatzer adjacent to the reshus harabim. Rashi addresses both this issues. [ii] Regarding the Gemara on 23a about a chatzer with two doorways, Rashi (s.v. Chatzer) explains that there Gemara is referring to a house which has two doors leading into the chatzer. Regarding the Gemara on 23b about one ner with multiple wicks, Rashi (s.v Shtei) explains that multiple people would want to be yotzei in the same location if a household is trying to fulfill the mitzvah according to the level of mehadrin, where one candle is light for each family member. The Maharsha points out the Tosafos does not understand the Gemara this way, because if the Gemara was limited to a case of people fulfilling the mitzvah at the mehadrin level the Gemara should have specified this. Furthermore, Tosafos couldn’t have said that it is a case of mehadrin min hamedhadrin, because they hold that mehadrin min hamedhadrin involves only one person lighting. At the end of the day, however, it seems that Rashi’s position is difficult. Why does he explain the Gemara on 23a to refer to a house with two openings into a chatzer when the simple reading of the Gemara is in accordance with the view of Tosafos, that the chatzer has two openings into reshus harabim. Additionally, later in the same beraissa there Gemara quotes that if one lives in an attic, one should light in a window close[iii] to reshus harabim, implying that the lighting earlier in the beraissa was also done facing reshus harabim. Perhaps we can suggest that Rashi and Tosafos argue over the correct definition of pirsumei nisa – does it mandate publicizing the miracle of Chanukah to the entire world, or just to one’s family. Tosafos assumes that pirsumei nisa’s intended audience is the general public, in which case the menorah must be placed near the reshus harabim. Rashi, however, things that both audiences are intended, and the halacha takes them both into account. One can’t light in their one home because that would lack in pirsumei nisa for the general public, but one can’t light at the entrance to one’s chatzer either, as that would lack in pirsumei nisa for one’s family. Therefore, one should light at the entrance of one’s home in order to accomplish both pirsumei nisa for one’s family and for, to a limited extent, the public. If this is case, it is understandable why Rashi understood the Gemara on 23a differently that the simple reading, and ignored a minor proof from Tosafos on 21b. [i] The Rashba (s.v. 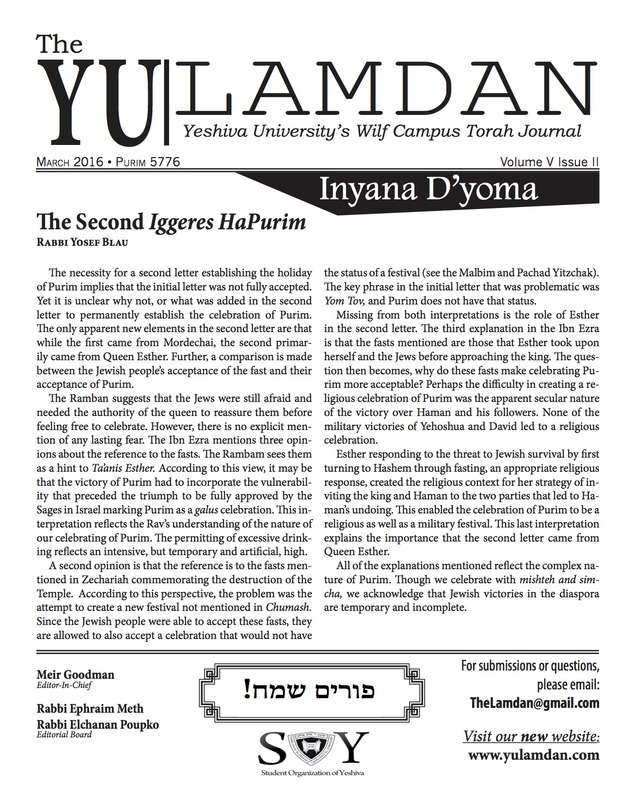 Ner) brings another Gemara as a proof to Tosfos, which is the opinion of R’ Yehuda quoted later on 21b that a storekeeper who lights his Chanuka candles in the public domain is not considered to be negligible if a camel laden with tinder was caught aflame by his menorah (since it was within his right to place the candles outside), which implies that one would be lighting the candles in the Reshus Harabim, because the owner of the camel would have no claim if he were trespassing into the Chatzer. The Tosfos Harosh (s.v. Mitzvah) points out that this isn’t a valid proof, because it could just be that the store was located adjacent to the Reshus Harabim. [ii] This is all assuming that Rashi holds that one would actually light at his house inside the courtyard, not like the Ritva (s.v. Mitzva) who says that Rashi really agrees with Tosfos and that Rashi is just saying that when one lights at the entrance to the courtyard adjacent to the Reshus Harabim, he should be place his menorah inside the courtyard. However, the Ritva’s understanding is difficult in light of the Rashi on 23a that we discuss. [iii] Although, perhaps the language of Semucha would actually imply like Rashi that the window isn’t directly opening to Reshus Harabim but is the window of the house that is closest to the Reshus Harabim (one manuscript of the Meiri, in fact, has the language of Pesucha which implies that it is directly opening to the Reshus Harabim).